This vintage real photo postcard features five circus dogs posed as if they were begging. The dogs are adorable and the photographer did an excellent job of posing these “talented” canines. The caption is in French and roughly means “Doggies Right Alignment”. The photograph is by the famed Albert Bergeret (1859-1932), a leading French postcard producer. Printing on the front of the postcard lists the studio as being located in Nancy. A postmark on the card indicates that it was mailed in 1902. To view other examples of Bergeret’s work and to learn more about him, click on the category “Photographer: Bergeret”. 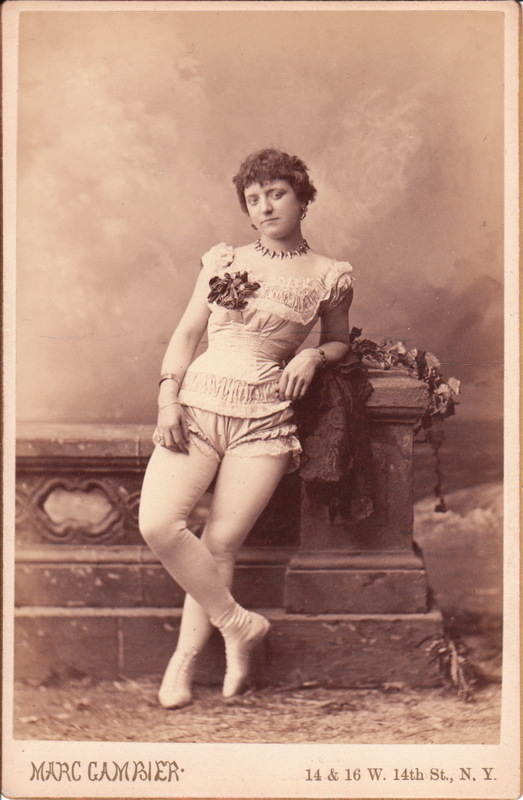 This cabinet card portrait features a pretty young woman who likely performed in a balancing act for an unidentified circus. 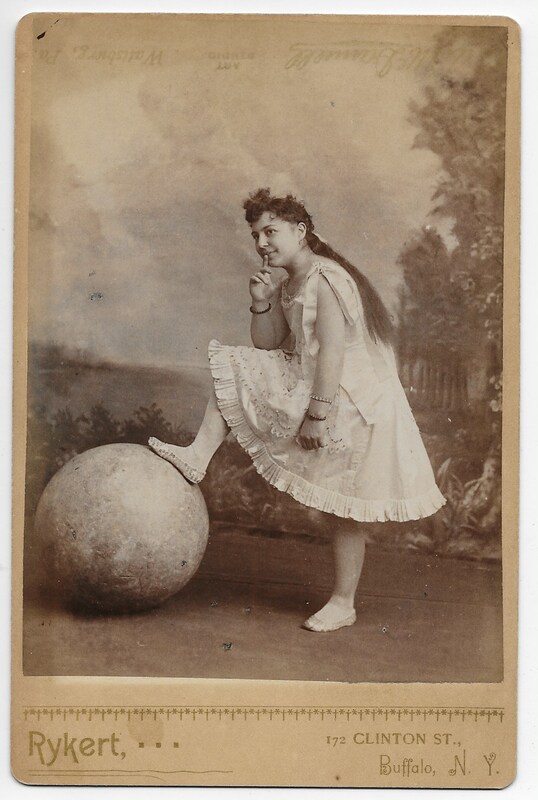 She has one foot on a ball that was used for balancing feats. The photograph is a bit risque for it’s era. The young lady is displaying a bit of a devilish grin. Note the upside down ghost image at the top of this image. The logo of the McDannell studio in Wattsburg, Pennsylvania is visible and the cause of this phenomenon is that this cabinet card was likely stored face-to-face with the McDannell cabinet card and The McDannell logo was pressed printed onto this circus performer photograph. It is worth mentioning that one of Mcdannell’s photographs is a resident of the Cabinet Card Gallery collection. 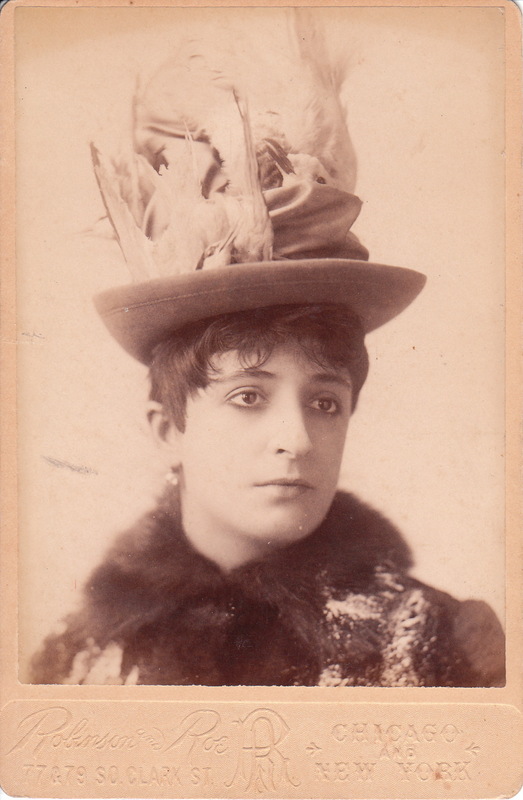 The above cabinet card image was produced by the Rykert studio in Buffalo, New York. Chauncy W. Rykert and William Rykert were both photographers in Buffalo. Both men shared a studio on Buffalo’s Jefferson Street in the late 1870’s. Chauncy is the most likely one who produced this image as he remained a photographer in Buffalo for many more years than William. 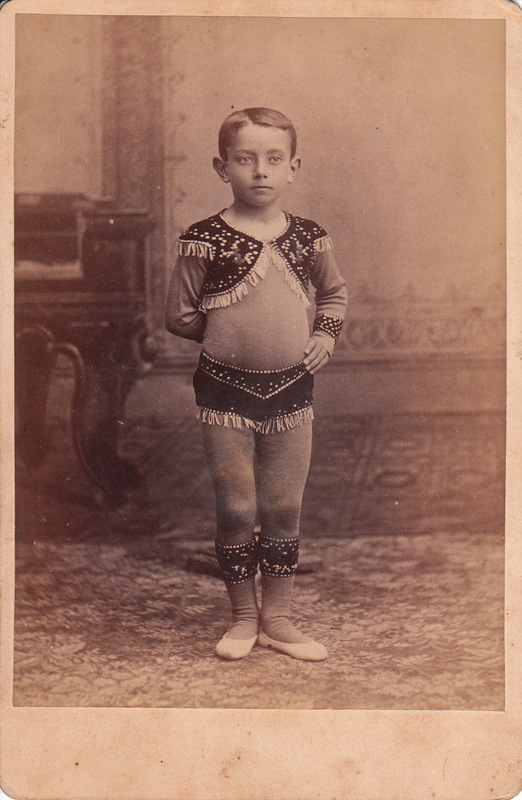 This cabinet card features a young boy who is likely a professional acrobat. The lad’s costume certainly is strongly suggestive that he is a circus performer. The child, as well as the photographer and the location of the studio, are all unidentified. This cabinet card is not a high quality photograph. It is out of focus and poorly posed. However, don’t complain because as the saying goes, never look a gift horse in the mouth. Speaking about horses, what do you think about this fancy equine? 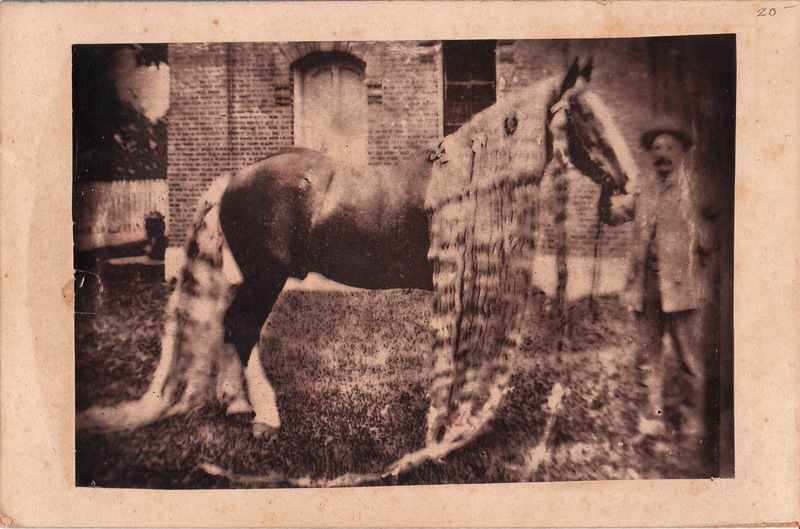 It is likely a horse from a circus or carnival. Although the hair extensions on the horse could not be more gaudy, it is important to note that someone went to a great deal of trouble and spent a lot of time to dress up this horse. The man handling the horse may be a trainer or perhaps a barn worker. The photograph was taken outside. There is no available information pertaining to the identity of the horse or photographer. The location where the photograph was taken is also unknown. 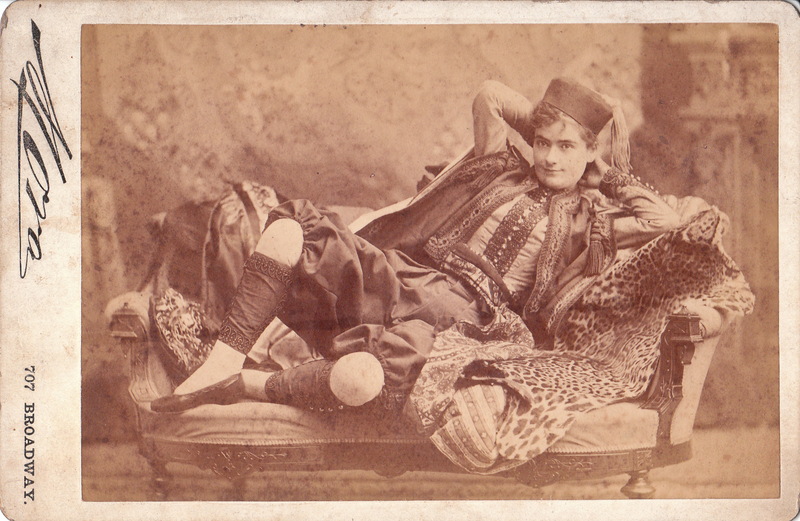 This cabinet card features an alluring woman lying on a divan in a very provocative pose. Note the leopard skin on the divan. This woman is likely an actress. She appears to be dressed like she is part of a harem. Rather than an actress, she may be a member of a circus act. The photographer is the famous celebrity photographer, Jose Mora. This image is risque for the time that it was made. To view other photographs by Mora, click on the category “Photographer: Mora”. ADDENDUM: An informed visitor to the cabinet card gallery has identified the subject of this cabinet card as being actress Jeffreys-Lewis. See the comment below to learn the interesting details.